Alex Ross & Jim Krueger do a serviceable job of whittling down this potentially complex storyline into a digestible mini-series with some perks. A lot of the draw of this series is the interactions between these age-old characters and their more modern counterparts, and when the story focuses on that aspect of the tale, it’s intriguing. How well does the original Namor get along with his older, wiser counterpart? The answer isn’t entirely unexpected, but it’s still a lot of fun to read. However, the duo’s story has the bad luck of falling right in the middle of the major revelations hidden in Secret Invasion, so readers familiar with that narrative will notice some inconsistencies in the behavior of certain team members. Six months ago, I wouldn’t have given their actions a second thought, but now that the level of detail and intricacy in the imposter heroes’ plans have been revealed, many of the key plot points in this book feel completely inappropriate. Krueger handles the script entirely on his own, and it’s generally awful, particularly the lines he gives to Spider-Man. He gets the idea that Spidey likes to frequently lighten the mood with bad puns, but seems to forget that his jokes are at least amusingly bad. In Avengers / Invaders it feels like the author is stretching to make everything Parker has to say into comedy gold, and clearly that isn’t his forte. After the first six pages, I was ready to start ignoring everything the character had to say, and I probably would’ve been better off if I had. Artist Steve Sadowski seems uncomfortable illustrating superheroes, which makes his assignment to this series, literally overflowing with costumed warriors, a bit puzzling. None of the heroes look comfortable wearing their own skin, between the awkward poses they’re constantly striking and the weird, often inappropriate facial expressions they display. 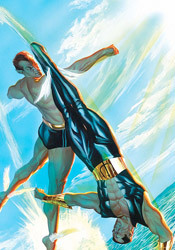 His rendition of Namor is generic and unrefined, while his Wolverine looks like he’s wearing pants that are three sizes too small and struggling with the consequences. Logan seems to have it pretty good, though – I don’t know how Spider-Woman has room to breathe in her outfit. By contrast, Luke Cage looks fantastic, if completely out of place alongside so much spandex, in his black leather coat and T-shirt. When he gets a chance to deal with a more civilian subject matter, Sadowski’s skills become much more pronounced, but such opportunities only come in small doses and his work with the Avengers and the Invaders is so bad that you’ll quickly forget all about such strengths. While it has its moments in the sun, this series isn’t something I’d go out of my way to continue reading. The concept of a younger, more naïve set of heroes interacting with their older, wiser selves in the future makes for a few good moments, although it never really capitalizes on its full potential. It’s a fine premise, but a slow pace, rotten dialog and mismatched artwork hold it back from becoming anything worth reading. Skip it unless you’re desperate to see Steve Rogers back in action.